» After this fire, an excess of caution? If anybody really wanted to see the Talking Water Gardens, these measures probably didn’t keep them out. 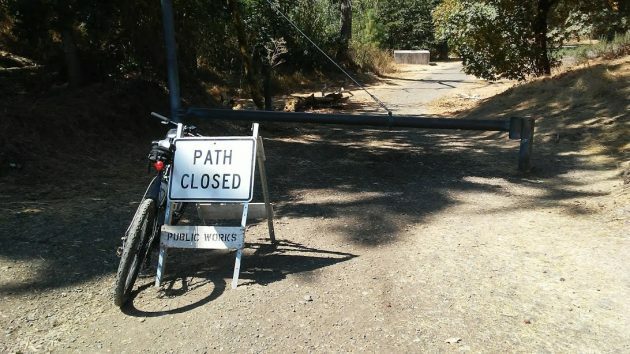 On Wednesday afternoon, on one of my regular routes, I encountered improvised “closed” notices at the entrance to the Water Gardens and the trail along the Willamette River into Simpson Park, and on the trail at Bowman Park as well. The signs at the Water Gardens invited people with questions to call Public Works. When I called, the helpful voice on the other end said the area remained closed to the public because the fire of the day before might be still be smoldering. Never mind that it’s about a mile from the Gardens’ gate to the fire site, and in between there’s the length of Second Lake. “Albany Fire Department and other local agencies continued fire mop-up work today, August 29, 2018, at ATI Specialty Alloys and Components (SAC). The fire was first reported yesterday, August 28, 2018, at 11:16 a.m., on the SAC property at a material staging area. Within that area, the fire impacted a flatbed trailer along with staged materials, including clean fiberglass ducting. The fire then moved through grass and wooded area, City of Albany Simpson Park and property belonging to International Paper, creating smoke that was reportedly seen throughout Albany. Firefighters were able to contain the fire around 3:00 p.m. yesterday, but remained onsite through today cleaning up hot-spots and assuring the fire was checked within its fire lines. 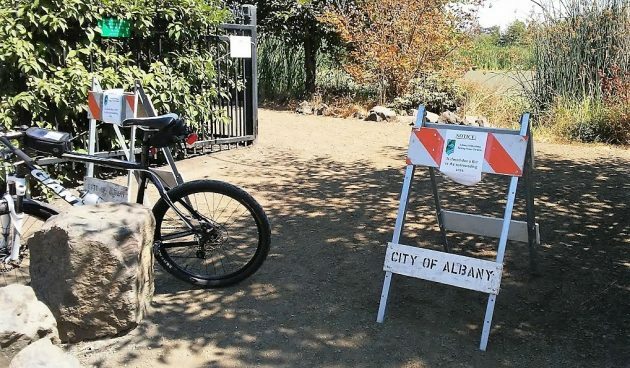 “The SAC property is within a federal Superfund site. 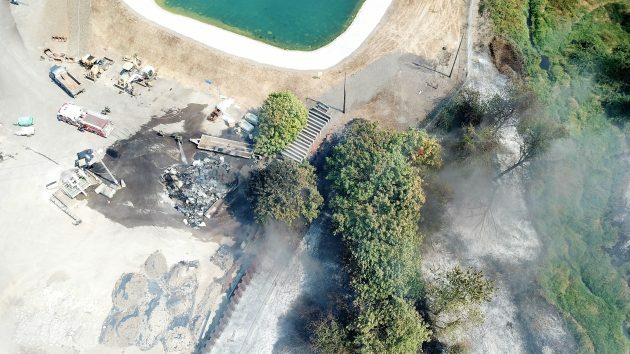 Although the fire is still under investigation, ATI does not believe any hazardous substances associated with the Superfund site were involved. Please refer future questions on the cause of the fire to ATI PIO Scott Minder. 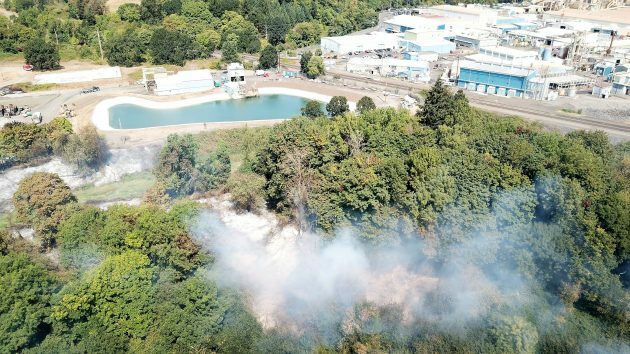 “Fire personnel will complete their work on site today at 5:00 p.m. Future visible smoke from the International Paper property is possible as a settling pond with layers of wood pulp burned during the fire. ATI will continue to provide water suppression to the International Paper property until which time it is determined to be safe to stop. The fire department released this photo of the ATI fire scene. Thanks for this report. I was in the area and smelled the fumes but didn’t know the source. The fumes did have a noxious smell. I hope there are no health consequences to nearby neighborhoods. Sounds like another, “damned if you do, damned if you don’t,” Hasso. Or as they say, better to error on the side of caution. However, they should certainly be removed today. Hasso, you need a Kickstarter fund to get yourself one of those mini-helicopters to ease your way into these breaking stories. I agree about the warning fatigue syndrome. It’s like “Flagger Ahead” signs on roads, I unscientifically swear there is a flagger about 20% of the time. Still in this case, I guess an abundance of caution isn’t hurting anyone. The key word in the story is “necessary”. The gummint wasn’t lazy or slow. Seems they set up a safe-distance perimeter to shield the public from harm. Mayhap an apology is needed.